Patrick Jones (poet, playwright and film-maker) invited Striking Attitudes’ professional dancers to collaborate with him on a music video for Manic Street Preachers who are re-releasing an album from 20 years ago. Patrick’s brother is Nicky Wire, the bass player from the Manics. The album will come with a free DVD of music videos from the past and some new extras, of which Striking Attitudes will be one. The track Striking Attitudes is dancing to is called ‘Repeat’ and the dance was interpreted as an anti-jubilee rant! 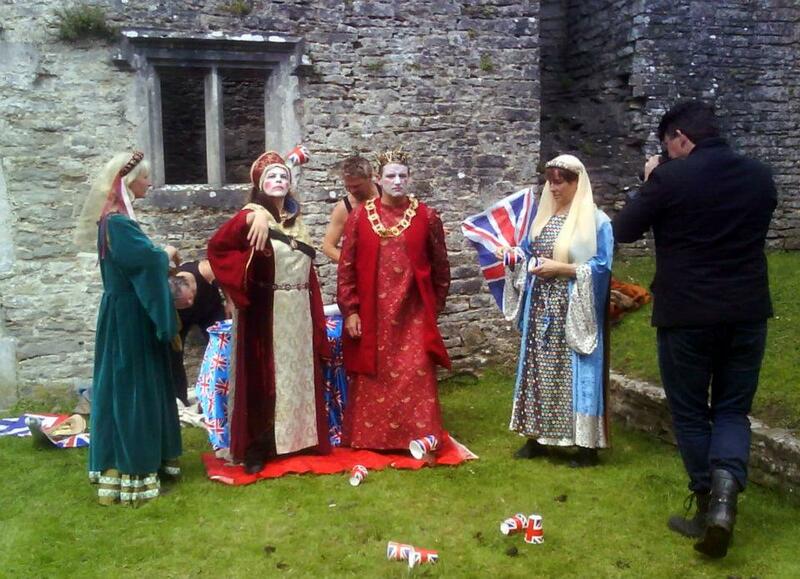 Filming took place in Beaupre Castle near St. Hilary in the Vale of Glamorgan. Patrick Jones directed and filmed, and Caroline Lamb choreographed. The Striking Attitudes performers were Brendan Chaleson, June Campbell Davies, Dylan Davies, Janet Fieldsend, Stuart Hulse, Miranda Knight, Caroline Lamb and Belinda Neave. Patrick’s poem Mountains of Man was used in Striking Attitudes’ FOOTFALLS film and it was a pleasure for us to have the chance to collaborate creatively with Patrick once again.